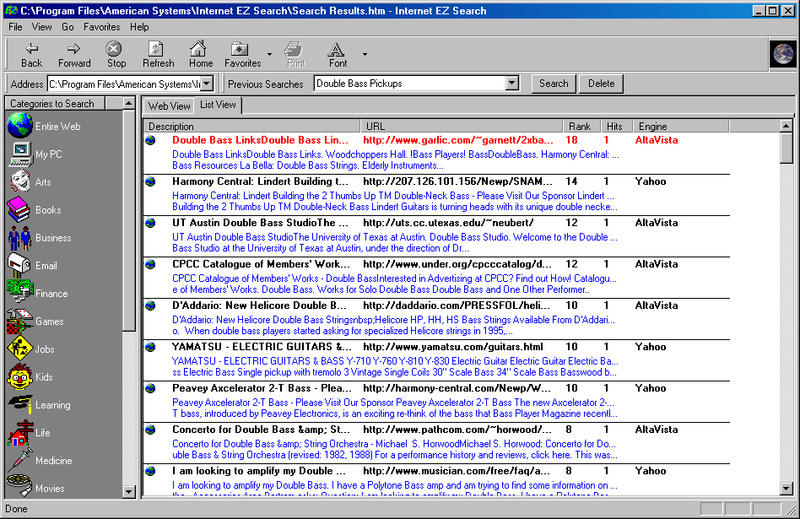 Internet EZ search lets your computer talk to all of the major Internet search engines at once! And it's designed to save you time and effort while searching the Internet and World Wide Web. You can use the built-in "categories" to search the entire Web, or just specific parts of it. Search in specialized areas like politics, email, business, finance, games, and more. The ability to search specific areas cuts down on your search time. ...... anytime. You can also specify the intensity of your search .. a single word, multiple words, or an exact phrase. Whether you want to search the entire Internet, or just certain parts of it, Internet EZ Search will do it for you and it does it very fast! Internet EZ Search does a great job of searching the Internet, but it can search your hard disk as well! Tell Internet EZ Search what text you're looking for and it will go out and find it on your computer. Have it search all your drives, all subfolders, or just specific folders. A fast way to find exactly the file you're looking for. A large number of file formats can also be viewed in Internet EZ Search. So, whether you want to search the Internet for information or find a letter you wrote to Mom, Internet EZ Search can do it quickly and easily. Internet Universal Remote: WooSnap! Your Internet, organized your way! Internet Zipper is the easiest way of saving URLs and the best way to keep them. Search for mp3 files on the Internet. Internet Speedup Utility, Banner and Popup Ad Filter. Surf 2x faster or more! Boost your Internet Connection speed up to 200% !!! The best available software online today to watch thousands of satellite movies. Qweas is providing links to Internet EZ Search 3.0A as a courtesy, and makes no representations regarding Internet EZ Search or any other applications or any information related thereto. Any questions, complaints or claims regarding this application Internet EZ Search 3.0A must be directed to the appropriate software vendor. You may click the publisher link of Internet EZ Search on the top of this page to get more details about the vendor.